My daughter and I ventured out to do Black Friday shopping at 11 pm and finished at 4 am! We gave new meaning to shop til you drop, armed with flyers and lists and good attitudes! We had minimal lines, shockingly, if any at all, hit all our stores and even snuck in a 4:30 am breakfast at Denny's ... Good times!! So, what's my card all about! group on SCS that I created after yearning to meet other christian crafters. And I'd like to give a great big welcome to the new members of the COF ..
Our hostess this month is Darlene! "People were bringing little children to him in order that he might touch them; and the disciples spoke sternly to them. 14 But when Jesus saw this, he was indignant and said to them, “Let the little children come to me; do not stop them; for it is to such as these that the kingdom of God belongs. 15 Truly I tell you, whoever does not receive the kingdom of God as a little child will never enter it.” 16 And he took them up in his arms, laid his hands on them, and blessed them." I have always loved the image that this brings to mind. The culture of the day was such that children were valued even less than women were, so once again, Jesus is teaching that he came for the least ones in society. My biggest pleasure in teaching Sunday School is always experiencing God's love and grace through the accepting eyes of children. So, with that in mind, look through your treasure trove. What do you have that shows the innocence of childhood? The pleasure in simple things? The wonder of nature? The pure fun of our world? What speaks to that child-like spirit that you remember from your childhood? Try to create something that takes you back to your childish, unquestioning, innocent faith in God. Create a little bit of heaven on paper! Thank you for your theme, D! 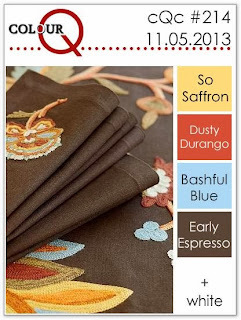 Be sure to stop in and see what the rest of the COF gals have made ... You can find them in my sidebar. Big hugs, a Bigger Blessings! which means the Calendar Girls post the cards we make with a chosen theme! And you know I have to decorate the insides of my cards! So I used another Riley and Co stamp which I just love!! And of course, see what the Calendar Girls have made. You can find their blogs in my sidebar! Happy wishes to all, today! which was wonderful for some crafty Cabana time! think this cute little mitten freebie is just adorable! And decorated the inside for future note writing. I'll enter this to the Newton's Nook Challenge this week. the globe starting with Julia's blog! of it, including getting crafty! And guess what I did ... crafted outside! I had my temporary table going into the shed and thought .. The doggies love being outdoors with me ...let's color! I went with a non traditional holiday card this week .. It's a Mystery - revealed! 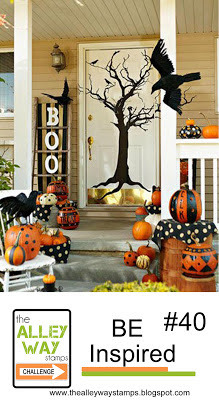 Today's post is a crazy, fun post! image from Mashi's Muffins called "Mrs. Claus." bit of Wink of Stella, silver. Thanks for stopping by today and oh! Dueling Darlings .. One for the guys! Here's my first attempt at posting from the iPad! asked us to create a card with the theme: masculine. with an extra twist: stamp of your choice on the tag! 'spell-check' from The Alley Way Stamps. For my card, I followed the sketch at Retro Sketches. but stop on by - they are quite inspirational! regarding the men in our lives. 'being in charge of' the turkey. but dad was in charge of carving it. Which was fine, except the one year he left it on the table. Oh it was such a NOT pretty scene! but the dogs were happy as can be! to see what they created with the guys in mind! new stamp release when I first saw it. I'd talk to a tree stump! I'll say hello and ask you how are. I say thank you and have a blessed day! but to share with others as well. it's brought to us by Joy. 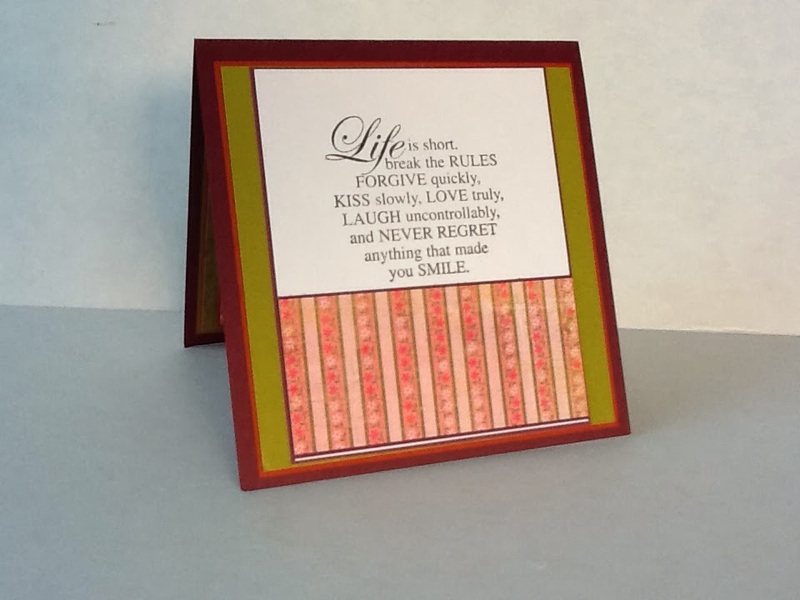 Her challenge is to use sentiments on your cards. I'll enter this to their challenge. please include the keyword Riley2313. 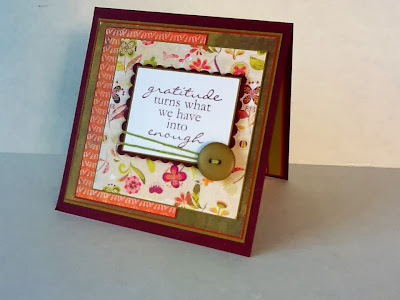 and Tuesday Throwdown - Gratitude. and lots and lots of friends! and the TAWS inspiration photo. to create my card today. 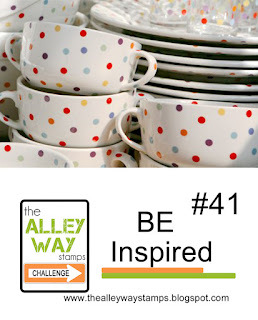 and the TAWS Be Inspired Challenge #41. 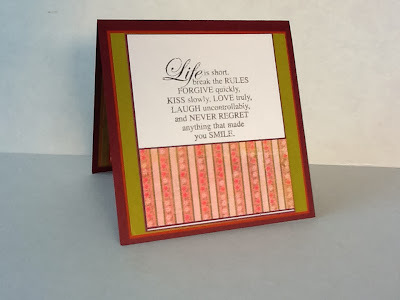 Bashful Blue: Sentiment and Image: The Alley Way Stamps "It's Fall About You"
Growing up in the military, this holiday always stands out special in my heart. My dad retired after 25 years of active duty service and my brother is still serving :) I spend quiet moments thanking all of our soldiers for their galiant and brave services to our country, and I'll be spending a sad moment visiting the military cemetery where dad is buried. To all the soldiers and families in the military, I salute you! Now back to enjoying Friday, how about a Friday Funny! I just love Stella from Bugaboo - she is so sassy! 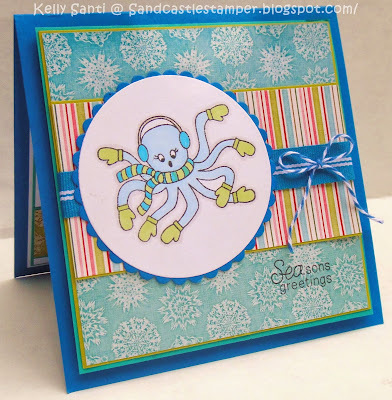 Sistehood of the Traveling Cards} card group, created over at SCS. For September and October--due on Halloween, October 31st--we are not making Halloween or Fall Cards this year--but birthday cards! YUP--my birthday is in October and it is a pretty big one this year. 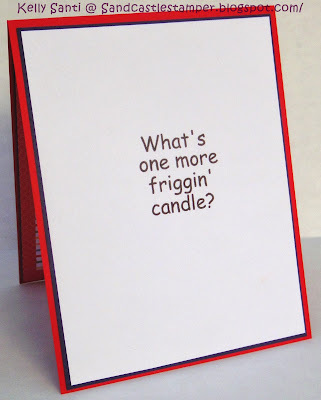 So--I am asking everyone to make a humorous birthday card for the swap. It can have some of those comical "older images" or a funny saying-image or you can use some hilarious background paper--you get the idea. Funny, sarcastic, witty, anything that makes you laugh out loud when you see it! 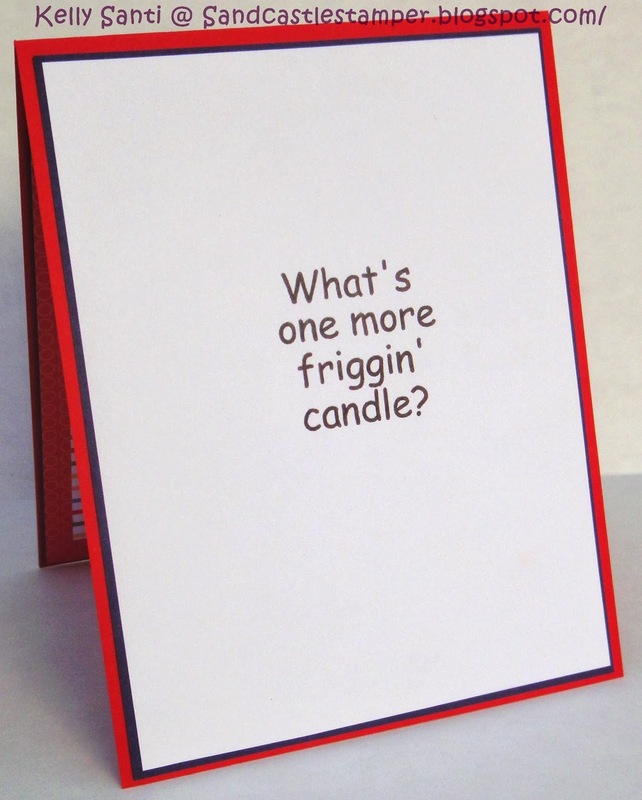 We all have friends and/or relatives who appreciate a card that makes them belly laugh when they see the card or read what is inside. Bring on the laughs and maybe tears if laughing too hard--let's Celebrate With Laughter! I grabbed my Stella birthday image and got to work! annual Red, white and blue swap that she holds - woot! with it - hopefully the swappers will forgive me this time - eeek! Thanks for stopping by today ~ I wish you well! 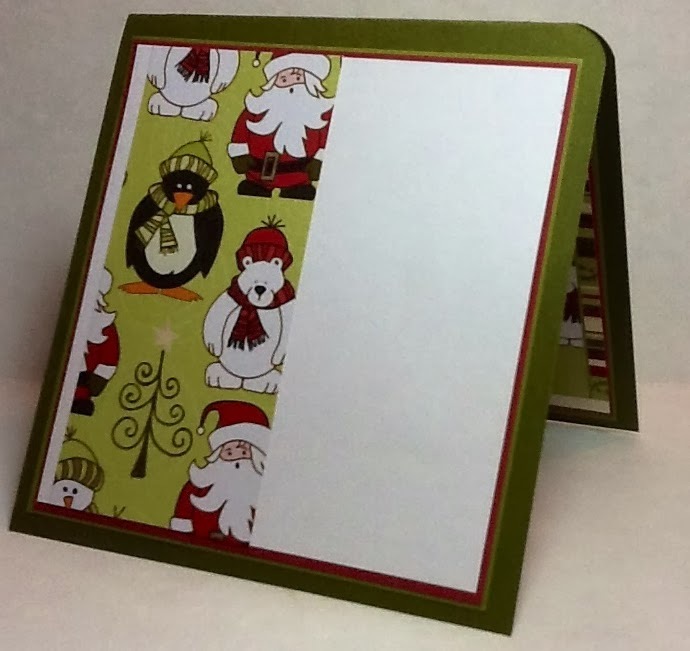 Cardstock: PTI Red and white: and SU Not quite Navy: DSP from SU! land of the forever sunshine and bright blue oceans! 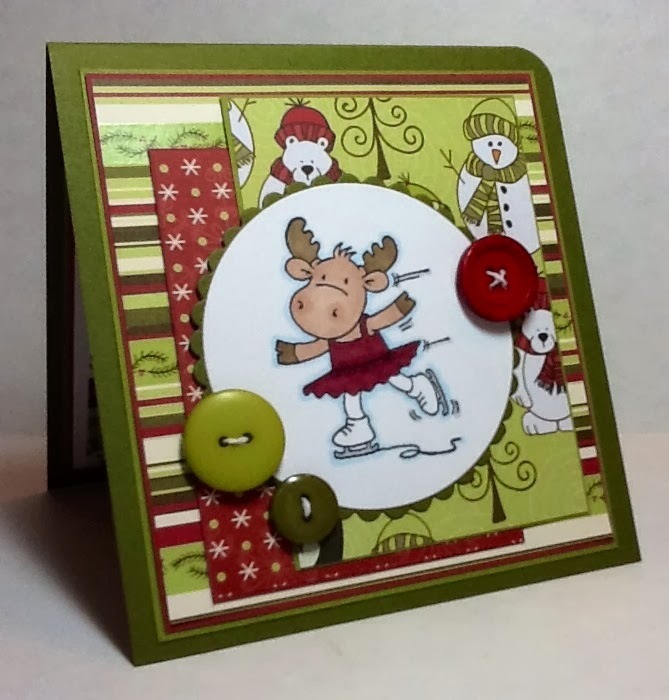 using the Newton's Nook stamps which are so whimsical and fun. it came from - isn't it cute! and decided to give it a try! Since we celebrate a rather Tropical Christmas here in South Florida, I thought this stamp set was just the CUTEST! release blog hop - thank you, Newton's Nook! Btw, if you haven't met Newton .. take a peek! Here is my card, using my VERY favorite color combo ever! 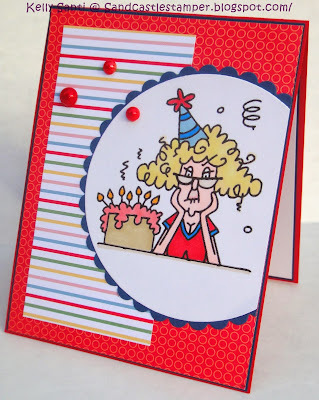 And you know me, I have to decorate the inside of my cards, too! Thanks for stopping by and I "shell" "sea" you soon! Happy SONday!! I hope your day is filled with wonderment! sleeking around in the bushes that I screamed at my husband to take me home, except were were 300 miles from home and 50 miles from the nearest hotel! Hi, my name is Kelly and I don't like rustic camping! See, it was my maternal instinct kicking in!! And here's my Wild Thing card! I went absolutely bananas when I first saw this stamp set because I had looked for it for a long time! The second I saw it, I had to buy it! You'll soon be seeing why - a card/post later on this month will explain :) In the meantime, I inked up another part of the set to create this little cutie. for the life of me who posted the sketch so I can't give credit. If it's yours, thank you! I adore it! I had a blast making a CAS card! Hubby and I are about to head 'into the wild' - our backyard! We have some overdue gardening, a true adventure into the wilds .. I'll enter this card into the TAWS Challenge, the Pile it On Challenge for "Animals with Character"
and the Simon Says Stamp Anything Goes challenge.